Annuity sales are shifting, and the direction is concerning. Have we forgotten the value of guaranteed income? Is the accumulation sale just easier for us to move assets? Why do we not sell the benefits of mortality credits on a regular basis? The troubling part is that a corresponding influx of other income-producing assets does not exist. When I spoke with the research firm, they had no explanation where these assets have gone. When looking at opportunities, I look to where the pendulum is likely to swing next. We have the largest transition from the workplace happening while life expectancies continue to grow. There has never been a greater need for guaranteed income that can’t be stopped until the retiree passes away. There has never been a better time to get ahead of the pendulum – talk to clients about the benefits of income riders and income annuities. Fill a gap for your clients. Talk to them about the overall benefits of using guaranteed income products in their retirement portfolio. Statistics tell us that the competition isn’t talking about them. 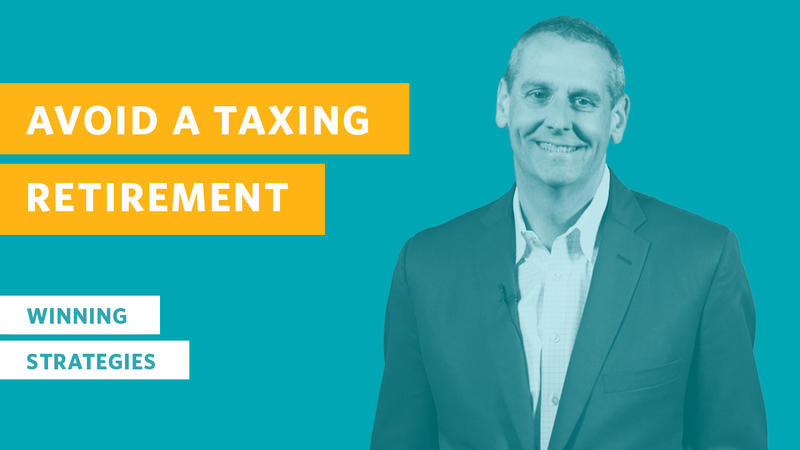 In this episode, Mike McGlothlin shares not one, but five Winning Strategies to create a tax-efficient retirement portfolio. These strategies will set you apart from the competition by adding value to your clients. 1Source: LIIMRA Secure Retirement Institute, U.S. Individual Annuities survey, VA GLB Election tracking survey and Indexed GLWB Election Tracking survey; analysis is of retail individual annuity market and excludes employer plan and structured settlements. Mike McGlothlin is a team leader, retirement industry activist and disciple of Indiana Hoosier basketball. In addition to being EVP of retirement at Ash Brokerage, he is a sought-after writer and speaker. His web series, “Winning Strategies,” provides insight and motivation for financial advisors in many forms – blogs, books, videos, podcasts and more. You can get his latest book, “Winning Strategies: The New Rules of Retirement Planning,” on Amazon. When I look at our industry today, I see a lot of commoditization. Our clients are driving transparency and asking for lower fees with more service. This combination makes it difficult to sustain a healthy business model, whether you’re commission-based or advisory-based. Asset allocation and rebalancing can be done online, which has driven down value in the eyes of the consumer. Now, you may provide exceptional service and other planning around asset allocation to add value, but the value of asset allocation has been driven downward. What is the key to driving value and making sure that you can earn a sustainable revenue stream? Generally, you need to lead the pack for those services and products that consumers find the most valuable. Keep in mind that price is a dollar amount. Value is how the client perceives it in their own eyes. 71 percent worry about health care costs. Government health plans are means tested and based on Modified Adjusted Gross Income levels. It’s important to have a strategy for keeping costs at a minimum through proper taxable income planning. 52 percent worry about future tax rates. Even with the Tax Cuts and Jobs Act, marginal tax brackets did not drop significantly. With Social Security and Medicare struggling financially past 2035, it’s easy to see a potential increase in taxes – payroll, FICA and income tax rates. 81 percent worry about running out of money and having to go back into the workforce. Guaranteed income could help alleviate that pressure. These three areas of service – health care, tax planning and guaranteed income – can provide significant lift for your business over the next few years. They are highly valued in the consumer’s eyes. To increase the value of your business and drive revenue through your firm, you need to meet the changing demands of the American population. People will always pay for value. Think about what your clients want more and design your firm and practice around those ideas. Health care might be one of the most expensive risks in retirement. Today, and most likely to continue for the foreseeable future, government health care premiums are based on means testing based on income levels. It’s important to understand the components of the income calculations. And, it’s equally important to determine how to control that income. In general, less taxable income translates to less health care premium. The goal for the retiree should not be to lower taxes, but increase net income. Net income can be positively affected by reducing taxes, lowering premiums and other costs, and increasing the gross income to the client. Let’s look at some techniques that can add control to the financial plan that might also increase the net after-tax income to your client. Many people tell me that purchasing a single-premium immediate annuity (SPIA) in today’s low interest rate environment is one of the worst decisions they could recommend. However, I think a SPIA can be the most effective tool in raising after-tax income for our clients. With today’s interest rates, a nonqualified SPIA can provide a high exclusion ratio for every payment received. This excluded amount is a non-taxable event and does not go into the calculations against Social Security taxation and health care means testing. In the United States today,there is as much housing wealth as the industry has in assets under management. The use of housing wealth might be the most underutilized strategy for any retiree. We ran simulations using housing wealth as a noncorrelated investment strategy during retirement. Every year that the markets ended down, the home equity was used to generate the income needed instead of the investment portfolio. This provided some time for the investment portfolio to recover. With a traditional systematic withdrawal strategy and no noncorrelated assets, the portfolio failed at age 95 in 26 percent of the simulations. The client would run out of income in more than one out of four situations. By using a withdrawal from the noncorrelated asset (home equity conversion mortgage), the failure rate dropped to just 2 percent. We decreased the risk of failure from one in four to one in 50. That’s a significant change in confidence for the American retiree. Noncorrelated assets don’t have to be just housing wealth. Fixed annuities with liquidity, cash and permanent life insurance are all noncorrelated assets. Life insurance and housing wealth provide access to these funds on a tax-free basis. Noncorrelated assets can be a great tool to control the tax on the retiree’s income and create flexibility of when to pay the tax based on the source of the income. Instead of looking at rates of return, look at your client’s net after-tax income as a benchmark for performance. Look for solutions to increase gross income while managing taxes and expenses to increase the funds available for the retiree to spend. Professor Jamie Hopkins joins us to explain how the tax reform bill impacts retirement income tax planning, focusing on tax efficiency. Whenever there is a significant change in the tax code, there are always unintended consequences. The Tax Cut and Jobs Act (TCJA) is no exception. While many people thought the new tax law created simplification and reduced corporate taxes, it might also create a dramatic and negative affect on charities. Obviously, those households that are charitably inclined will continue to support their favorite charities. However, many Americans are motivated to make donations based on financial advantages. I want to point out that there are great opportunities to continue making charitable contributions that can impact the tax control of a retiree’s income – one such technique is the use of Qualified Charitable Distributions (QCDs). QCDs allow for required minimum distributions up to $100,000 to be directed to a charity directly from the plan participant’s IRA. The distribution does not count as income – that’s a really important distinction. A deduction, most likely, would be taken off adjusted gross income with some limits. A QCD simply does not count as income. The use of QCDs hasn’t been popular recently, but I can’t pinpoint why. Many planners haven’t used this strategy because the client was able to take a deduction above and beyond the standard deduction. Now, tax laws have changed, making it more difficult to make a charitable contribution the “traditional” way. The tax law change should make you think and act differently. Talk to clients who are taking RMDs about changing their contribution to Qualified Charitable Distributions. The Tax Cut and Jobs Act made great strides in transferring wealth by increasing the federal estate tax exemption to $11.2 million per person. The problem is many Americans no longer feel the need to complete estate planning. That’s incorrect thinking. One of the costliest taxes at death is the income tax on the transfer of nonqualified annuities. This will likely come as a surprise to many beneficiaries as most planners have not addressed the issue. You can address it by giving your clients and their beneficiaries more control. One of the more innovative income riders has received a private letter ruling that provides great tax benefits. The income that is generated to the current owner/annuitant receives an exclusion ratio. All other income riders are taxed as last in, first out (LIFO). 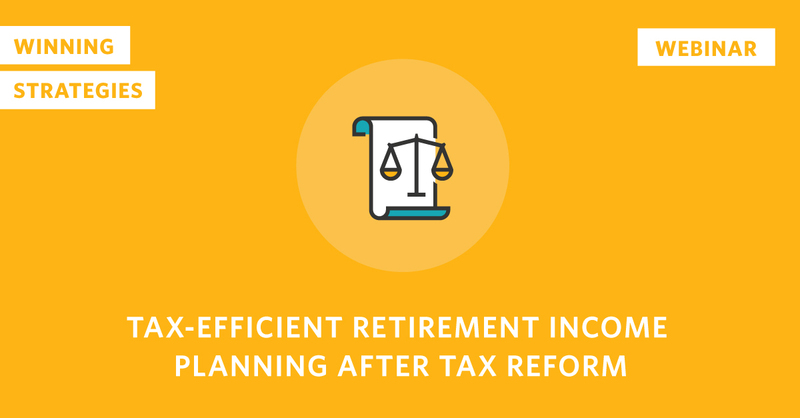 This tax advantage allows the client to be more intentional about the source of retirement income. The use of an exclusion ratio might boost net after-tax income to the client while taking pressure off the assets under management to perform. For clients using taxable certificate of deposit interest as income, this maneuver can make a significant increase in gross and net income. More importantly, the rider allows the beneficiary control over how they receive the transfer at the death of the owner/annuitant. The beneficiary can “harvest” the cost basis in the nonqualified contract through a lump-sum distribution or by continuing the monthly income. I like to think of this strategy as putting the tax man at the back of the line instead in the front of the line. If you provide that level of value to your clients and their beneficiaries, you are in a great position to retain those funds through the next generation. That’s the best way to retain assets and attract new clients. Think about getting your clients in a better position to harvest the cost basis on their nonqualified annuities during the transfer process. It can help the client now and the beneficiary later.